From fashion, to the outdoors and wildlife, to outdoor activities and wedding themes, L.L. 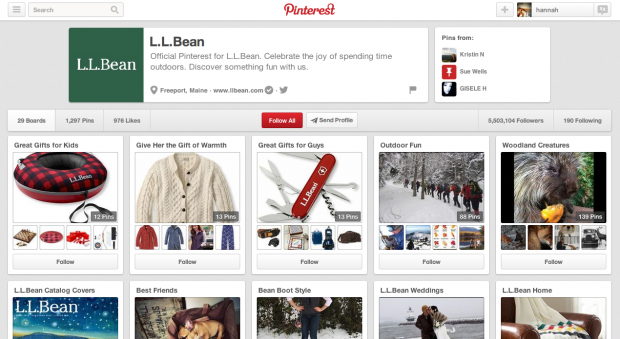 Bean has 29 different boards that cover images types and subjects for all of its different fans. Their “Woodland Creatures” board has 4.5 million followers, showing just how well this brand knows how to attract customers. They recently added boards that are just in time for the holidays. “Great Gifts for Guys” has over 65,000 followers and features pins like their sweaters, boots and jackets. 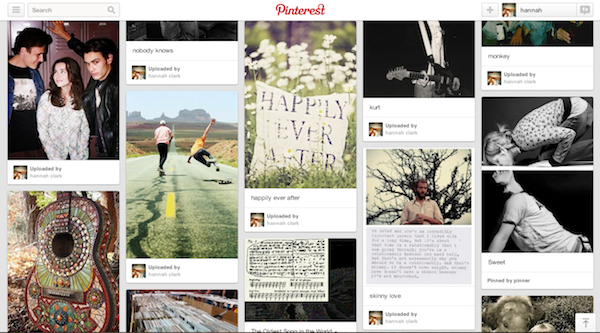 Make sure to check this brand out when surfing through the Pinterest boards. 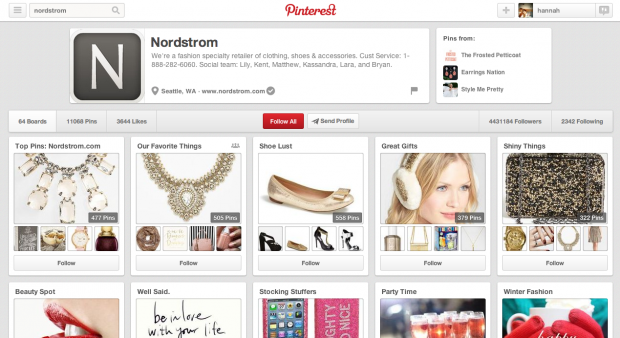 Nordstrom’s 64 boards feature all kinds of fashion, DIY, decor and designer boards for their large number of followers (and shoppers) to enjoy. Their most popular board, “Our Favorite Things” has over 4.2 million followers and features mostly wedding related content. I couldn’t help looking through it and now I have plenty of ideas for my future wedding (full of flower crowns, flowy bridesmaid dresses, and awesome table setting ideas). Nordstrom also saw the opportunity in holiday marketing and have added boards like “Great Gifts” and “Stocking Stuffers”. There is a lot there to inspire your own wish list. Need tips on how to style your kitchen, or maybe you’re looking for inspiration for your next party- Lowe’s Pinterest page can help. You can find 55 different boards full of home improvement tips, color-themes, grilling, man-caves and more. Lowe’s is consistently pinning their favorite DIY projects and instructions. 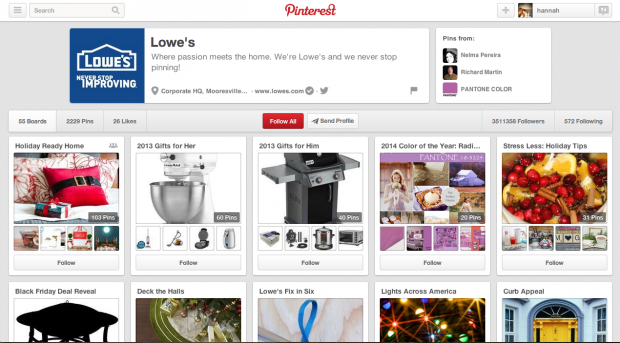 Lowes’ most popular board, “Build It!,” gives it’s 3.4 million followers all kinds of DIY projects. This board doesn’t feature much of Lowe’s merchandise, and instead is full of pins of projects from outside sources. Here you can learn “How to Make a House Shaped Planter” or get inside information on how to transform your old furniture into something unique, stylish and just like brand new. 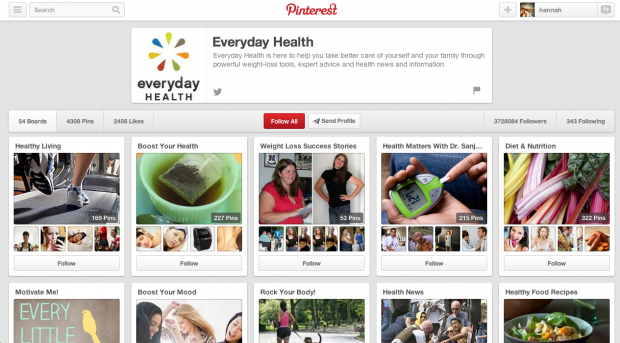 Everyday Health’s range of 54 boards include all kinds of recipes, weight loss success stories, guest boards and lifestyle topics. Not only will you see boards by famed nutritionists, but also tips on getting that toned booty. Many boards also have inspirational quotes and sayings, which will give you that extra push you needed to keep living a healthy lifestyle. 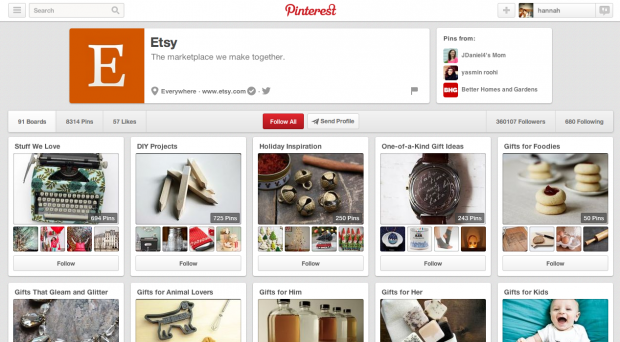 Etsy channels into some of the most popular categories on Pinterest. Their range of 91 boards is full of crafts, jewelry, home goods and clothing. Each other their boards is extremely colorful, and shows just how diverse Etsy really is. Because of this, there is a huge variety of topics; something for everyone. Etsy’s board “Cool Spaces” will have you dreaming of home decor changes and house renovations in no time. The nearly 250k followers of this board get to see content that is from all over the web, encouraging pinners to get out and see what they can do for themselves.